It's 2096 and having a bomb strapped to you is a sport. In the deathmatch of the future, your uniform is a time bomb. 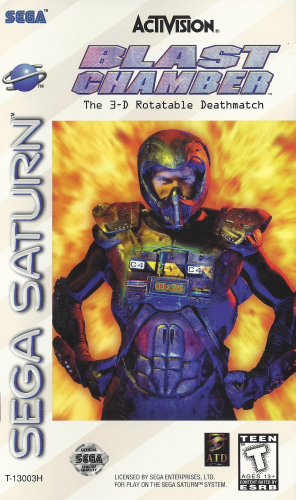 Sealed in the 3-D rotating Blast Chamber, you strive to cheat death as walls become floors and floors become ceilings. Time counts down while you and up to three opponents scramble madly to control the one thing that can save you - the crystal. Extend your life or shorten your opponents' to avoid a fiery death. Want to play? Sixty 3-D rotating chambers: Survive 20 multi-player and 40 single-player chambers. 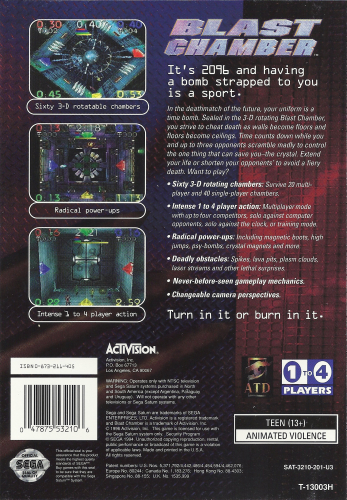 Intense 1 to 4 player action: Multiplayer mode with up to four competitors, solo against computer opponents, solo against the clock, or training mode. Radical power-ups: Including magnetic boots, high jumps, psy-bombs, crystal magnets and more. Deadly obstacles: Spikes, lava pits, plasm clouds, laser streams and other lethal surprises. Turn in it or burn in it.